Alberta NDP Leader Rachel Notley visits an oil and gas pipe fabrication plant in Calgary, Alta., on April 15, 2019. NDP Leader Rachel Notley and UCP Leader Jason Kenney spent the final day of the Alberta election campaign declaring themselves the best advocate to jump-start stalled pipelines, leaving voters with a choice between two starkly different approaches to the province’s economy and the rest of the country. Tuesday’s election will determine whether Alberta stays the course with Ms. Notley’s cautious tack of the past four years to build consensus on the Trans Mountain pipeline, or Mr. Kenney’s promise to attack anyone he perceives as standing in the way – a list that includes Prime Minister Justin Trudeau, the premiers of B.C. and Quebec, environmentalists and others. Record turnout at advance polls has suggested high enthusiasm in the province, but delays in counting more than 200,000 ballots could also leave the ultimate outcome in doubt for days if the results are close. For Mr. Kenney, the final stretch of the campaign was also complicated by an RCMP raid involving one of his candidates. 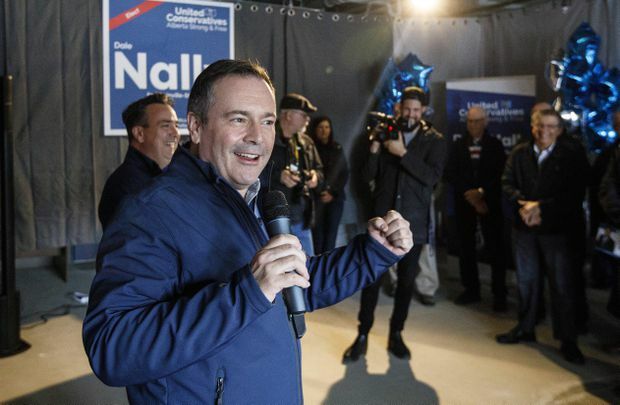 Mr. Kenney is widely viewed as the front-runner, with a Globe and Mail poll released on the weekend adding to a list of survey results that have given the United Conservative Party a comfortable lead over the New Democrats. The Alberta Party is hoping for a breakthrough, while the Alberta Liberals are seeking a seat for the party’s new leader. “We must have leadership that will stand up with strength and clarity to defend jobs and our vital economic interests,” Mr. Kenney said. United Conservative Party leader Jason Kenney speaks at a rally before the election, in St. Albert, Alta., on April 15, 2019. 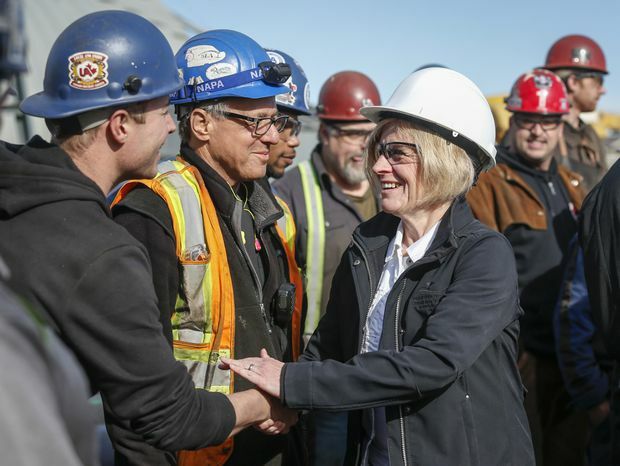 Ms. Notley, who donned a hard hat for her final news conference of the campaign at a pipe fabrication yard in Calgary, said her pipeline strategy has worked and the Trans Mountain expansion is within sight. She warned Mr. Kenney would reverse that progress. She took specific aim at Mr. Kenney’s promise to cancel the NDP government’s oil-by-rail program, which would see the province lease rail cars to ship crude, and his renewed threats to cut off oil shipments to B.C. Ms. Notley has promised to continue adding new spending to social programs while taking a measured approach to deficits that would balance the budget a year later than Mr. Kenney’s plan. The NDP’s “path to balance” relies heavily on oil revenues rebounding. Ms. Notley also brought up the involvement of the province’s election commissioner and the RCMP after allegations related to the UCP leadership race in 2017. The latest cloud over Mr. Kenney’s party came last Thursday, when the RCMP executed a search warrant at a business owned by Peter Singh, the UCP candidate in Calgary-East. Neither the RCMP nor the party provided any details about what prompted the search. Mr. Kenney said he had not reached out to Mr. Singh, although he said his campaign staff had been in touch. Mr. Kenney said Mr. Singh had not been contacted by police, but that his son had. Mr. Singh previously issued a statement that confirmed police seized several items that were later returned. His campaign said he would not be speaking publicly until after the election. RCMP spokesman Fraser Logan confirmed the search, but declined to provide any details. Documents related to the search warrant have been sealed. The RCMP and the province’s election commissioner are both looking into donations to one of Mr. Kenney’s rivals. Separately, a former UCP MLA, Prab Gill, wrote a letter to the RCMP with allegations that Mr. Kenney’s team used fake e-mails in the leadership vote. Mr. Kenney has denied any wrongdoing and has threatened to sue Mr. Gill.